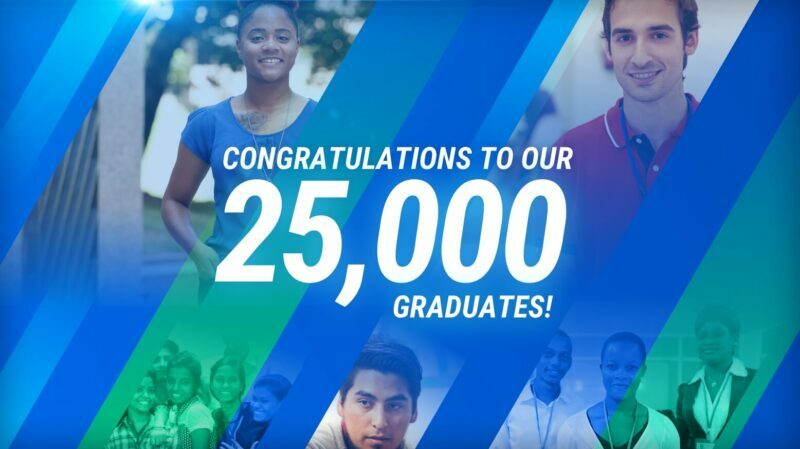 Generation has reached a remarkable milestone: 25,000 graduates. In just four years, Generation has grown to be the largest global demand-driven youth employment program. Offering programs across 24 professions as varied as digital marketers, certified nursing assistants, and financial services salespeople, Generation is an employment program that connects young adults aged 18-29 with skills and jobs. The typical Generation graduate comes to the program having struggled with unemployment or underemployment. More than 40% of them have dependents—children, siblings, parents, grandparents—who rely on them to help make ends meet. They learn through intensive boot camp style trainings that prepare them for success in their new roles in weeks, not months, which keeps program costs low and gets them into employment quickly. Programs are currently offered in Hong Kong, India, Italy, Kenya, Mexico, Pakistan, Singapore, Spain, and the United States—with four additional countries opening programs soon. Generation’s curricula are developed hand-in-hand with employers. Through a process called “activity mapping”, Generation identifies the activities that differentiate a great employee in a given role from a merely adequate one. Program participants then practice those activities and the related technical and behavioral skills repeatedly through role plays and simulations to be able to hit the ground running day one on the job. Generation provides social support services, mentorship, and a community that helps ensure learners’ success both during the program and after they transition to the workplace. Graduates are connected directly with employers who have jobs available, so they can find work immediately. In fact, 82% of graduates have jobs within six months of completing the program. And Generation carefully tracks the data required to demonstrate the program’s return on investment for both young people and employers. Eighty-three percent of employers say that Generation graduates outperform their peers and that they would hire again from Generation. Generation is actively recruiting participants and employer partners for its programs through its website generation.org.